Behold the dugong (Dugong dugon). It's the only strictly marine herbivorous mammal. They feast primarily on sea grass and are particular about what fields they feed upon. Related to both the manatee and elephants, they have forsaken their hind limbs in favor of a whale-like tail and forepaws in favor of paddles. They've also forsaken comeliness in favor of a vacuum-style mouth. They are supposedly the source of many mermaid myths. I imagine those confused sailors either need to have their eyes checked, or maybe they just spent too much time at sea. I think they must have been desperate! The scurvy must have affected their eyesight. 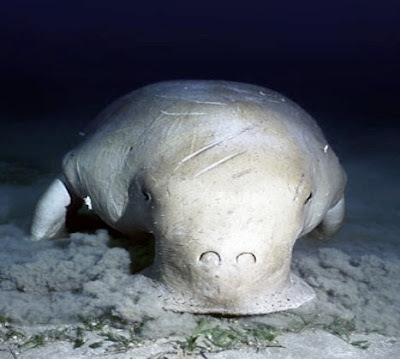 About the dugongs inspiring the mermaid myths, it is interesting to note that among the Malays of south-east Asia, the word for 'mermaid' is 'duyong'. Could there be a correlation ? Perhaps. Yes, there is a direct correlation. That's where their name came from.